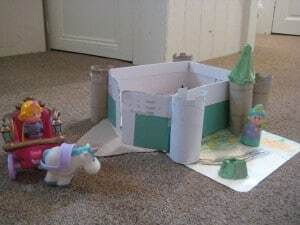 My daughter visited a real castle this half-term with her grandmother so this morning she decided to make a castle of her own. She raided our craft box to find a shoe box, toilet roll tubes and an egg box – and this is what she created. She’s delighted with it and unbeknown to her she’s been nurturing important skills whilst making it. Lots of mathematical aspects are used when junk modeling: she has visualised in her mind what she wanted to create and had to select and put together the right three dimensional objects to realise her vision. She’s been manipulating different shapes (she said the draw bridge was a ‘semi – oval’) and sizes (she had to reduce the circumference of the tower to make the egg box spire fit on top) – and problem solving too, as she had to find an alternative to glue to stick on the towers. It also gave us the opportunity for a quick history lesson as she had lots of questions about what life would have been like in a castle. Children really learn through doing and activities such as junk modeling give them anopportunity to be creative and to experiment, whilst having fun. And she’s still playing with it now. One of her little people has been given lots of yellow wool hair and, as Rapunzel, has been banished to the tower.